The University of Alaska is committed to providing a safe and healthy environment for its students, employees, and visitors, by prohibiting tobacco use and smoking, including the use of electronic cigarettes and similar products, within its campuses and facilities. Board of Regents Policy 05.12, paragraph 102. 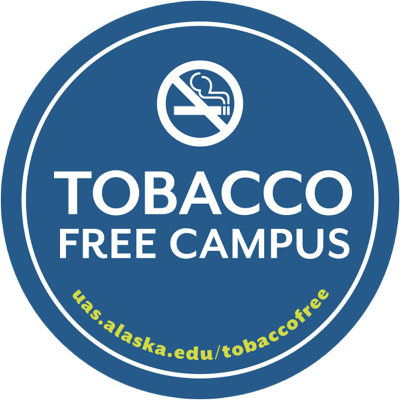 In December 2014, the University of Alaska Board of Regents voted to implement a tobacco-free policy across all campuses in the UA system. UAS is tobacco free as of July 1, 2015. Smoking and the use of all tobacco and tobacco-related products are prohibited within all university real property, buildings, and vehicles. Littering an area with, or with the remains of, tobacco-related or smoking-related products is also prohibited. Smoking or the use of tobacco products is allowed in personally owned vehicles parked or being driven on campus and on public sidewalks or public rights-of-way that border campus.